When air is drawn into your ducts to be distributed throughout your home as heating or air conditioning, other things are brought in as well. Dust, dirt, and other materials are all sucked inside and get trapped in the duct which makes it easy for them to pollute the air as it passes through. If you've noticed that your allergies bother you even indoors, children or the elderly having issues with breathing, or anyone with breathing disorders struggling, the culprit may be poor air quality due to dirty ducts. Even those without any kind of health trouble will still find themselves run down, so getting it taken care of is best for everyone! The other issue with blocked up vents is that it's far harder for the air to pass through them, especially if it's allowed to build up for a long period of time. The air slowing down means it takes longer for rooms to warm up or cool down, and the air conditioning and heating systems must run longer to make up for it. Not only does it waste energy, but it means that the temperature in various rooms will fluctuate and be uncomfortable. Making sure your ducts are periodically cleaned out will take care of these problems right away! 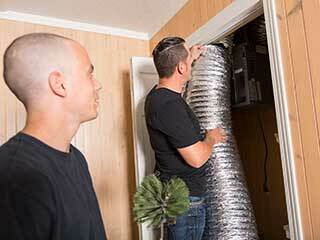 Our trained technicians would be happy to come out and get to work whenever is best for you. We use equipment of the highest quality to ensure that the job is done thoroughly and quickly as well! You can also rest assured that there will be no troubles with cross-contamination of dust and otherwise into your home's air, thanks to our high-powered vacuum and other such tools. It will be done before you know it, and you'll be able to breathe easier in no time! Call Air Duct Cleaning Katy today and take the first step towards freshening up your home's air and lowering that outrageous energy bill! You'll only regret not getting it done sooner.